Actress Kangana Ranaut is known to be a hardworking actress. On a recent shoot schedule, the actress was severely injured on the sets of her upcoming film Manikarnika: The Queen of Jhansi at Ramoji Filmcity, Hyderabad. Kangana was shooting for a tricky sword fighting sequence, when she was accidentally struck by her co-star Nihar Pandya’s sword. The producer of the film Kamal Jain, while talking to a leading daily, informed that the two had rehearsed several times and during Nihar’s attack Kangana had to duck but the timing could not match. The actress has got a deep cut between her eyebrows. 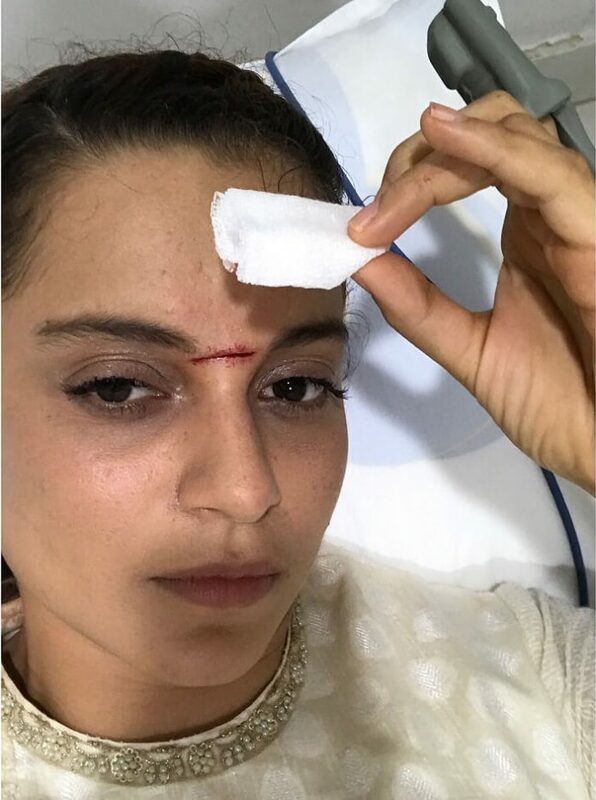 It took about 30 minutes to reach the hospital, but Kangana was brave enough to bear the pain and bleeding. Ranaut’s co-star Nihar, felt terrible and was constantly apologising but the actress pacified him. Reports say that the actress has received 15 stitches on her forehead and will remain at the hospital for a few days. The doctors who attended her said that it was a close call as the cut was very close to the bone. Kangana’s doctors also said that the injury might leave a scar and might need a cosmetic surgery later. The stunts of the film are directed by action director Nick Powell, who has earlier worked in the Hollywood projects like The Last Samurai, The Bourne Identity and X-Men: The Last Stand. Powell has also worked on the Rajinikanth and Akshay Kumar starrer 2.0 directed by Shankar. Also read – Manikarnika’s poster relelase in Varanasi! The film Manikarnika: The Queen of Jhansi is a biography on Rani Laxmi Bai, who was also known as Rani Jhansi and is directed by Krish. The Kangana Ranaut starrer biopic also features Ali Fazal, Ankita Lokhande and Arjun Bajwa. The makers of the film held a grand poster and trailer launch event at Varanasi a while back and are expected to release the film on April 27, 2018. Next articleAjay Devgn unveils the first poster of Taanaji - The Unsung Warrior!